I have an extensive range of coasters that you can mix and match. They depict some of my fine art prints and also some designs that have been published as cards. They are produced in the UK on high quality heat resistant board with a glossy finish and measure 9cm x 9cm. All images are copyright protected and must not be reproduced without permission. Contact me if there are any designs you want in larger quantities and see the 'Discontinued' section for other designs that can be included with wholesale orders. Was £4.50 now £3.50. 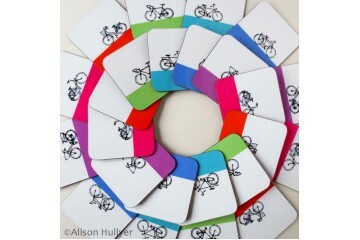 Hardboard backed coaster from an original design by Alison Hullyer. The..
Hardboard backed coaster from an original design by Alison Hullyer. They are produced in the UK u..
Was £4.50 now £3.50.Hardboard backed coaster from an original design by Alison Hullyer. They are ..
Hardboard backed coaster from an original design by Alison Hullyer. They are produced in the UK o..
Hardboard backed coaster from an original drypoint print by Alison Hullyer. Please contact Ali..
Hardboard backed coaster from an original design by Alison Hullyer (90mm x 90mm)..
Was £4.50 now £3.00.Hardboard backed coaster from an original design by Alison Hullyer..
Was £4.50 now £3.00. Hardboard backed coaster from an original design by Alison Hullyer..
Hardboard backed coaster from an original design by Alison Hullyer. Now discontinued, but can ..
Was £4.50 now £3.50 - only one available.From an original drypoint print of a Boast and fish by Alis..